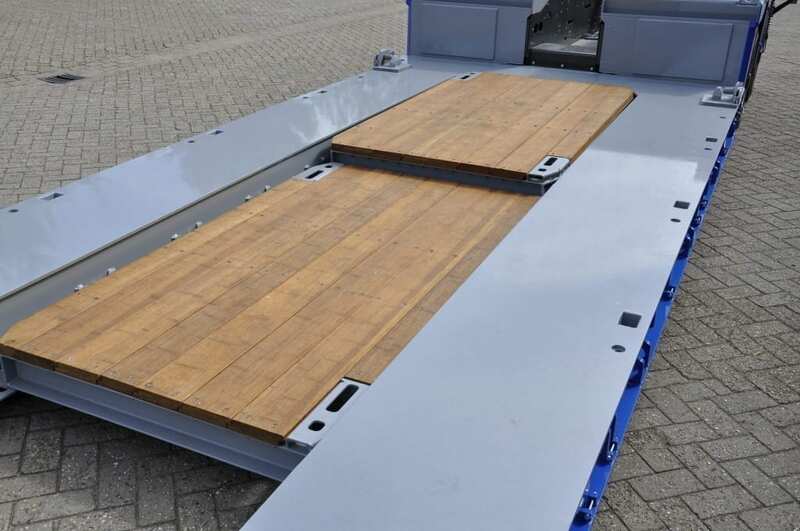 Since hardwood is getting scarcer and more expensive all the time, Nooteboom is looking for alternatives for the production of their trailer floors. Bamboo composite has so far proved to be an attractive, durable alternative. Hardwood is very strong and exceptionally durable. However, it has one major disadvantage: it will become scarcer in the coming years. The trees, from which the hardwood floorboards are cut, grow very slowly; it takes 35 to 50 years before they are mature enough to be cut. Nooteboom only uses the top-quality timber from the centre of the trunk. This scarcity also affects the price. Therefore it comes as no surprise that Nooteboom began to look for alternatives for the hardwood floors they are using now. An important starting point was that the alternative had to be equally as good as the current floors but preferably it would have even better specifications for application in abnormal transport. From this investigation bamboo composite emerged as the best alternative. In the meantime Nooteboom has been testing it in practice for nearly two years with extremely positive results. One advantage of bamboo is its low weight; with a floor thickness of 30mm, as used on a Teletrailer, bamboo is 100 to 300 kilogrammes lighter per cubic metre than hardwood. For the floor of e.g. a flatbed semi-trailer, approximately one cubic metre wood is used, which means a considerable weight saving. Another important advantage is that bamboo expands only by 1 percent when it gets wet; this is 4 to 5 percent for hardwood. Bamboo has a slightly higher adhesion coefficient than hardwood. When testing it in actual practice bamboo, being a composite material has proved to be warp-proof even after years of use. And the product also looks good. An additional advantage is that bamboo – one of the fastest growing plants in the world – is widely available. Worldwide there are more than 1,500 species of bamboo. The kind BambooTeq uses is the fastest growing plant species in the world. In just a few months this bamboo can grow to be 20 metres high or more; after five years the bamboo is ready to be harvested. During the production there is hardly any waste, since all of the cut material is used. The bamboo we use comes mainly from sub-tropical southern China; no giant pandas live in this area. Resin is one of the things that are added to the bamboo to create the bamboo composite. This gives it its extremely strong properties. BambooTeq has already developed one variety of 30mm thick boards from laminated long strips of bamboo – to be used on flatbed semi-trailers. A second variety of 40mm or 50mm thick boards is composed of several layers. This version is suitable for low-loaders and semi low-loaders. In cooperation with the supplier Nooteboom will further develop the composite floor for special transport. At the moment the composite floor is available as option for part of the Nooteboom vehicle programme. Although the bamboo floor is currently slightly more expensive than the one in hardwood, many customers have shown interest in bamboo composite and it has already been used on various vehicles. This trend is expected to grow in the coming years especially since in the future the difference in price will become smaller and this composite floor will be developed further.